China has emerged as the top destination for Pakistani students studying abroad with 19,000 of them in China this year. This figure is more than 3 times the 6,141 Pakistani students currently enrolled in the US universities, according to data available from reliable sources. China is hosting over 440,000 foreign students in 2017, up 35% from 2012. No other Asian country has as many foreign students as China does today, according to Shanghiist. The countries sending the largest number of students to China are South Korea, the United States and Thailand, followed by Pakistan, India, Russia, Indonesia, Kazakhstan, Japan and Vietnam, according to data from China's Ministry of Education as reported by Chinese media. The number of students from countries involved in China's One Belt, One Road (OBOR) initiative, also known as The Silk Road Economic Belt and the 21st-century Maritime Silk Road that includes China-Pakistan Economic Corridor (CPEC), has significantly increased. In 2016, students from the 64 countries in the initiative saw 200,000 students coming to China to study, representing an increase of 13.6% compared with one year before. 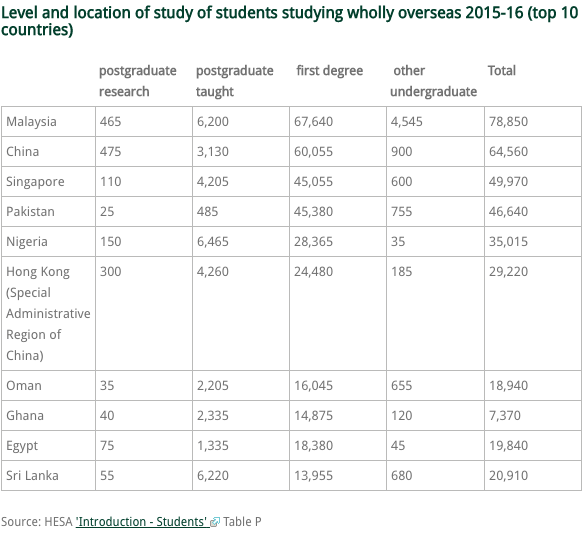 Even after the dramatic increase of Pakistani students going to China, the United Kingdom still remains the top source of international education for Pakistanis. 46,640 students, the largest number of Pakistani students receiving international education anywhere, are doing so at Pakistani universities in joint degree programs established with British universities, according to UK Council for International Student Affairs. The number of students enrolled in British-Pakistani joint degree programs in Pakistan (46,640) makes it the fourth largest effort behind Malaysia (78,850), China (64,560) and Singapore (49,970). China is now taking a page from the successful playbook of the Americans and the British to project their soft power through education. The Chinese government is making significant investment in scholarships and facilities to foster a greater understanding of the Chinese culture and language globally, and expand Beijing's soft power. China has emerged as the top destination for Pakistani students studying abroad with 19,000 of them in China this year. This figure is more than 3 times the 6,141 Pakistani students currently enrolled in the US universities. Chinese government is investing in scholarships and facilities to entice foreign students, particularly those from countries such as Pakistan that are part of China's Silk Road initiative, in an effort to project its soft power. Subramanian now lives in New Moti Bagh: a leafy estate in the heart of the capital, where grace-and-favour bungalows are granted only to elite civil servants, making it arguably the most powerful neighbourhood in India. “This place has been called the new Forbidden City,” he says, in reference to the walled imperial palace in Beijing, the heart of Chinese government for five centuries. India’s equivalent is less forbidding: a compound of 116 white bungalows and 10 apartment blocks nestled amid pleasant parks, through which the resident officials, judges and military top brass go for their morning walks. Subramanian is sitting in the spacious living room of his own six-bedroom, two-storey home, dressed in a white linen shirt, black jeans and brown leather loafers. At 57, he looks trim and speaks with rapid, Tigger-ish energy. Outside, the mid-afternoon sunshine is falling on his front garden, whose verges are filled with lush green shrubs. The house resembles a colonial-era bungalow, with a roof terrace on the second floor and two sets of servants’ quarters at the rear. It is actually newer than it looks, he says: the entire area was rebuilt about a decade ago, hence the “new” in New Moti Bagh. Though spartan when he arrived — “there was maybe a wooden bed, a cabinet, but basically nothing else” — the interior is now pleasantly decorated with furniture he and his wife Parul shipped back from Washington DC, including a series of Impressionist-style paintings by his elderly father, a retired civil servant. Modi’s support for globalisation is deeper than most people realise, he adds, a flip side of the fact that India is now a much more open economy than commonly acknowledged. The country’s future growth is not without challenges, however. “We have this whole ambivalence about the private sector which we’ve never really overcome,” he says. Yet he remains bullish, claiming that he expects India to catch up with China “within the next 20 or 30 years or so”. China has been able to bring 500 million people from poverty into middle class in the last few decades. That should be the goal of any country. India is more interested in becoming a global power than taking care of the masses. World's second largest country with largest inferiority complex. ISLAMABAD: In a major development that may attract $50 billion Chinese investment to Pakistan, Islamabad is expected to sign an MoU with Beijing on Saturday (today) for financing and developing the North Indus River Cascade which has the potential to generate 40,000MW hydro electricity. The $50 billion investment comes on top of the $46 billion investment being provided by the Chinese government and Chinese banks for financing power and road infrastructure projects in Pakistan under the China-Pakistan Economic Corridor (CPEC). With the signing of the MoU – which will be witnessed by Prime Minister Nawaz Sharif who is on an official visit to China – Beijing will emerge as the biggest financier of infrastructure projects in Pakistan. According to the studies conducted by the Water and Power Development Authority (Wapda), Pakistan has an identified potential of producing up to 60,000MW of hydroelectric power. Some 40,000MW of this potential power is located in the region called the Indus River Cascade, which begins from Skardu in Gilgit-Baltistan and runs through Khyber-Pakhtunkhwa as far as Tarbela, the site of Pakistan’s biggest dam in. The Indus River Cascade includes Diamer-Bhasha Dam project for which Pakistan needs $15 billion financing. Other multilateral donors were not willing to invest on this project but now China has come up to finance this mega project. Sources said the Chinese side conducted survey and studies on the North Indus Cascade including the sites of Pattan, Thacoat, Bunji, Dasau and Diamer in February 2017. The Chinese side in their last high-level meeting agreed to convert the survey and initial study to an MoU whereby the Chinese will conduct a detailed study spanning over a period of three months on a developing roadmap for financing that will lead to initiation and completion of these mega projects. Sources said this will be Pakistan’s first-ever private sector investment in mega projects in hydel resources as until now only Wapda led such projects. The most important development could be the Chinese undertaking of these projects as it has a vast experience for building such huge dams. According to the sources, the CPEC and the North Indus River Cascade can be the biggest-ever Chinese investment in Pakistan. An important step to strengthen engineering education and research in Pakistan was taken in 2004 when I was chairman of the Higher Education Commission. It was decided to establish a network of several world class foreign engineering universities in Pakistan. The model chosen was visionary and unique. It involved partnerships with consortia of top universities (rather than with any single foreign university) so that good quality foreign faculty could become available in sufficient numbers in Pakistan......... On May 19, 2008, just three months after ECNEC had granted approval to the projects, the new government abandoned the programme completely. I did not give up. In 2015, I approached Imran Khan with the idea and he immediately agreed to set up an Austrian university in Haripur and Hazara. The university is being funded by KP government and four of the best universities of Applied Science and Technology (‘Fachhochschule’) have agreed to form a consortium and give their degrees in Pakistan. Debunking The Myth of #China Colonizing #Pakistan. #CPEC #OBOR #India http://www.valuewalk.com/2017/05/cpec-helps-china-colonize-pakistan/ … via @ValueWalk After DAWN published the exclusive CPEC master plan revealing China’s seemingly apparent plans to colonize Pakistan and turn it into its own economic colony, the Indian media erupted with amusing reports. Media outlets claimed that Beijing is taking away the independence that the Pakistanis regained from the British Empire with their blood and sweat nearly 70 years ago. But the idea of China colonizing Pakistan and establishing a comprehensive, nationwide control – economic, governmental and military – over Islamabad should not be so amusing to Indians. If it really happens, they would have to worry about the Chinese growing regional might not only on their country’s northern and eastern borders but also the western one. DAWN released the exclusive CPEC master plan, which has even made some Pakistanis explode with outrage over the alleged colonial appetite of the Chinese during the first One Belt, One Road summit, which hosted government officials from 57 countries earlier this week. While the master plan does offer a gloomy outlook for the Pakistanis, who are no strangers to struggling with colonialism from foreign powers, let’s not forget that every coin has two sides. Let’s flip the coin for a second and take a look at the not-so-gloomy outlook for the Pakistani economy and the Pakistani people in general as a result of the implementation of the China-Pakistan Economic Corridor. The project is expected to create 2 million direct and indirect jobs in Pakistan alone and boost the country’s GDP growth rate to 7.5%, according to a report by U.S.-based consulting firm Deloitte and Touche. Like every development project between two nations, CPEC offers both benefits and negative impacts. For example, the CPEC master plan cited by DAWN reveals China’s plans to take over “thousands of acres” of agricultural land in Pakistan for “demonstration projects.” But let’s not forget that those very infrastructure, roads and highways developed by CPEC create unprecedented opportunities for poor Pakistani regions which have been surviving below the poverty line for decades. And while Pakistani governments both past and present have struggled to help those poor regions break free, the foreign investment that comes with CPEC could make a significant difference for the poor living nearby and inside the regions connected to the corridor. It’s not only the estimations that CPEC will create 2 million employment opportunities for the Pakistanis that improve the livelihood of locals, but also the fact that the corridor connects hinterlands with coasts, allowing big businesses to move to neglected regions. To quote the DAWN report citing the CPEC master plan, China is set to create a “full system” of monitoring and surveillance for major Pakistani cities from Peshawar to Karachi and is even set to spread Chinese propaganda through the country’s TV, delivering it through fiber optic cables. While China’s vast investments into CPEC open the door for the Chinese to create monitoring and surveillance systems in Pakistan, it’s worth pointing out that the infrastructure projects spurred by the Chinese investment are improving the livelihood of the Pakistani people. While probably no one can argue against the importance of high-quality hospitals and schools for every country and the livelihood of its people, China is opening medical centers, hospitals and educational institutions in Pakistan. Earlier this month, residents of Pakistan’s southwestern port city of Gwadar saw the opening of a hospital donated by China. Besides the hospital that allows for better emergency medical treatment to Pakistanis, China also built a new school in the port city in September 2016. More medical and educational infrastructure projects spurred by China’s investments are set to open along CPEC in the coming months and years. How bad is China’s “colonization” for Pakistan’s economy? The DAWN report further notes that the CPEC master plan “envisages a deep and broad-based penetration of most sectors of Pakistan’s economy as well as its society by Chinese enterprises and culture.” While the actual “negative” impact of such “deep and broad-based penetration” is yet to be seen, China’s penetration of various sectors of the Pakistani economy, especially its energy sectors, does not sound like bad news. Energy is actually the game-changing pillar of CPEC projects and China’s investments in Pakistan. In fact, 11 of the 19 early harvest projects under CPEC have a goal of ensuring an uninterrupted supply of electricity. While as much as $34 billion of the entire CPEC Chinese investment has been allocated to electricity production and distribution alone, the coal-fired plants, hydropower facilities, and wind and solar power farms that are being built in Pakistan are expected to prevent cuts of the electricity supply in the country, significantly improving the livelihood of the populace and helping make the Pakistani economy work more efficiently. While the DAWN report suggests that Chinese enterprises “will play the lead role in each field” of the Pakistani economy, a “leading role” of the world’s second biggest economy in a neighboring state that is tightly connected to it already cannot be a negative thing. CPEC connects Xinjiang to Gwadar and Karachi, with pathways of the projects running through the entire country, thus improving connectivity and creating new supply and logistic chains – things the past and present governments of Pakistan have struggled to do without foreign investments over decades. So is CPEC a BAD THING for Pakistan? Most Pakistanis have been living under the illusion that each and every citizen of their country would become wealthy and prosperous thanks to CPEC. But that’s not necessarily true, as the corridor only gives the means for Pakistani people and Pakistani businesses – both small and big – to benefit from the game-changing project and its vast economic opportunities. Approximately 2,500 new Pakistani students were enrolled in Chinese universities this year, taking the total number of Pakistani students in China to 22,000, according to a senior official of the Pakistani Embassy. With such a large number of students from Pakistan studying at Chinese universities, China has now become the largest foreign destination for Pakistani students, he told APP here. Out of the total number of Pakistani students, 3,000 are completing their PhD degrees while others are studying engineering, economic, management, agriculture, medicine, information technology, communication and languages. According to experts, these students, who secured their admissions under scholarships, are representing Pakistani society in China and are fast becoming a source of enhancing cultural exchanges and people to people contacts between the two countries. Chinese universities are rising quickly in the list of Asia’s best universities, with Peking University becoming the second best institution in Asia. In total, 45 Chinese mainland universities have made it to Asia’s top 300, while six are from Hong Kong and 25 from Taiwan. “As the Chinese universities strictly follow rules and regulations, it would benefit our students,” the official added. A student studying at the Beijing Language and Culture University told APP that she hopes to get employment in projects being completed under China-Pakistan Economic Corridor (CPEC), a flagship project of the Belt and Road Initiative, after finishing her degree. According to statistics released by the Chinese Ministry of Education, more than 200,000 students from 64 countries along the Belt and Road Initiative were studying in China last year. Such a growth rate exceeds that of China’s international students as a whole, said Xu Tao, director of the ministry’s department of international cooperation and exchange, as more than 440,000 students from 205 countries and regions were studying in China last year. China continued to provide the lion’s share of foreign students to US universities in the 2016-17 academic year, but their number grew at a slower rate than previously, a study has shown. Education consultants suggested the slowdown might have been triggered by an increase in the number of options available to young people as well as growing safety concerns among their parents. Of the more than 1 million foreign students who enrolled at universities in the United States in the period, 350,755, or about 35 per cent, were Chinese, the Open Doors study by the Institute of International Education, a non-profit organisation supported by the US government, said. The total – which comprised 142,851 undergraduates, 128,320 postgraduates and almost 80,000 non-degree students – represented an increase of 6.8 per cent from 2015-16, but that was lower than the 8.1 per cent gain recorded 12 months earlier. The number of Indian students saw the fastest rate of growth, expanding more than 12 per cent to over 185,000. Gu Huini, founder of ZoomIn Academy, an education consultancy based in Shanghai, said the US was still a popular destination for many mainland students, but no longer the top choice for his clients. “In the past two years, more and more parents are asking us about Canadian universities,” he said. Parents were becoming increasingly anxious about security issues in the US, especially since the Las Vegas shooting and the disappearance of Zhang Yingying from her University of Illinois campus, Gu said. The 26-year-old went missing in June and authorities in the United States said she is presumed dead. A man has been arrested and charged with her kidnapping. According to a separate survey conducted by the institute of about 500 campuses across the US, the number of foreign students who enrolled this autumn – for the 2017-18 intake – fell by about 7 per cent from the previous year. The decrease followed a dip of 3.3 per cent in the autumn of 2016, which was the first downturn recorded by the organisation since it began reporting such data in 2005. Some people suggested the slide might be attributable to the US administration’s move to ban students from Muslim majority nations. However, Allan Goodman, the institute’s president, was quoted by The New York Times as saying it was too early to make such an assumption, adding that part of the reason for the decline was that governments in Saudi Arabia and Brazil had reduced their spending on scholarship programmes. Given the profoundly anti-science attitude of our (Indian) government leaders, things are not likely to change in a hurry. In contrast, US’s National Science Foundation and National Science Board have recently released their biennial science and engineering indicators which provide detailed figures on research and development (R&D), innovation and engineers. But its true message is in a different direction, “China has become,” concludes Robert J. Samuelson in a column, “or is in the verge of becoming – a scientific and technical superpower. This is not entirely unexpected given the size of the Chinese economy and its massive investments in R&D, even so, he says, “the actual numbers are breathtaking”. China is the 2nd largest spender in R&D after the US, accounting for 21% of the world total which is $2 trillion. It has been going up 18% a year, as compared to 4% in the US. An OECD report says that China could overtake the US in R&D spending by 2020. China has overtaken the US in terms of total number of science publications. Technical papers have increased dramatically, even if their impact, as judged by citation indices, may not be that high. China has increased its technical workforce five times since 2000 to 1.65 million. It also has more B.Sc. degrees in science than any other country and the numbers are growing. The US continues to produce more PhDs and attract more foreign students. But new international enrollment at US colleges was down for the first time in the decade in 2017. The Trump administration’s anti-immigration rhetoric and actions are scaring away students. China has begun shifting from being an assembler of high-tech components, to a maker of super computers and aircraft and given the pattern of its investments in R&D and technology development, it is focusing on becoming the world leader in artificial intelligence (AI), quantum communications, quantum computing, biotechnology and electrical vehicles. As of now, the US still continues to lead in terms of the number of patents and the revenue they generate. China has also become a more attractive destination for foreign students and is now occupying the third slot after the US and the UK. This year, it is likely to gain the second spot. China now has a serious programme to attract its own researchers back to the country. The thousand talents plan targets scientists below the age of 40 who have PhDs from prestigious foreign universities. The government offers 500,000 RMB ($80,000) lumpsum to everyone enrolled in the programme and promises research grants ranging from one to three million RMB ($150,000-$300,000). The funding for the programme is growing and in 2011, China awarded 143 scientists out of the 1,100 who applied, and in 2016, 590 from 3,048 applicants. Individual Chinese universities are offering several times that sum. One specialist in advanced batteries from an MIT post-doctoral programme was offered a salary of $65,000, $900,000 as research grant and $250,000 to buy a house. The report also flagged the serious deficiencies in US higher secondary education where in 2015, average maths scores for the 4th, 8th and 12th graders dropped for the first time. In the field of R&D and patents and revenue accruing from them, the US remains ahead, but the recent anti-immigration trends pose a serious long-term risk to the American supremacy because in essence, the US has been the best in harvesting talent from across the world. Pakistan-China Institute launched Chinese language classes here on Monday, in a move to provide opportunities to businessmen and other professionals who are interested in doing business in China. Speaking at the event, Pakistani Senate Chairman Mian Raza Rabbani said he is happy about the commencement of the Chinese language classes by the important think tank in Pakistan, adding that the Pakistan-China friendship has been mutually beneficial for the two countries in strategic and economic terms. Mushahid Hussain, head of the Pakisan-China Institute, said it is important to enhance people-to-people contact between the two countries. Chinese Ambassador to Pakistan Yao Jing said language is the vehicle of basic understanding, and that the commencement of Chinese language classes will bring closer cooperation between Pakistan and China, adding that by overcoming the language barrier, both peoples will better understand each other's culture. The Chinese language classes started eight years ago in Pakistan schools, and the newly launched one is the second phase of such classes for businessmen, academics, and intellectuals. Zhang Yang, a businessman from Chongqing in southwest China, is searching online forums for fellow stout-hearted entrepreneurs willing to cast aside security concerns and join him on a scouting mission to Pakistan. ISLAMABAD, Feb. 7 (Xinhua) -- Rubab Batool, a student from an underdeveloped village of Nawab Shah district in Pakistan's southern Sindh Province, recently left for China to pursue a master's degree of management sciences. Talking to Xinhua upon her departure, Batool said that she chose China for higher studies because the launch of China-Pakistan Economic Corridor (CPEC) has opened up a huge demand for Pakistani graduates from Chinese universities. Batool is only one of 22,000 Pakistani students who have chosen China for their higher education. In 2017 alone, about 2,500 new students were enrolled in China to pursue their degrees in various fields, according to a recent statistics released by the Pakistani embassy in China. Muhammad Shaheen, Batool's father said that he belongs to a conservative family and many of his relatives stopped him from sending his daughter to a foreign country for education, but he has faith in Batool and the Chinese education system. "I am sure she will achieve her dreams by acquiring quality education from China," Shaheen said. Last month, the first batch of Pakistani students who were enrolled in a two-year program of Chinese language learning program at Beijing Language and Culture University returned home after successfully completing their course. The students, who left for China in 2016, said that they not only learnt the Chinese language but also got a clearer idea of the Chinese culture and the people. An official with the country's Higher Education Commission said that they provide merit-based doctorate scholarships annually to brilliant students to five top-rated Chinese universities. "The students showed great interest in studying in China as Chinese universities are among the best universities of the world so students from different faculties including science and technology and arts chose China for pursuing their degrees," the official said. According to latest statistics of Pakistani embassy in Beijing, currently, 2,700 Pakistani students are pursuing masters and doctorate degrees in top Chinese universities on fully funded scholarships sponsored by the Chinese Government. Kalsoom Sumra, a doctorate degree holder in policy sciences from Peking University, is working as an associate professor in Pakistan's top-ranked university Comsats University of Information Technology in Islamabad. Sumra told Xinhua that as a Pakistani, it was a good experience for her to know the culture of China and the deep ties of Pakistan with China. She said that China is becoming a destination for students from Pakistan and other Asian countries as the country is competing with higher education in developed countries and Chinese higher education institutes have introduced advanced teaching resources. Usman Ali, a 28-year-old Pakistani who got a Bachelors degree in medical sciences from China, is now serving at a well reputed government hospital in Pakistan. He said Chinese universities provide medical studies to Pakistani students at affordable rates. In Pakistan, private medical colleges charge 0.6 to 1 million rupees (about 6,000 to 10,000 U.S. dollars) from a student a year, whereas Chinese universities provide much better education at a cost as low as 3,000 dollars a year. "I have had a great learning experience from my practical work in Chinese hospitals. Pakistan has a long way to go to get to the level of China in health sector and I hope that I and other graduates from China will use our experience to improve the situation of medical health care in Pakistan." 52% of new Silicon Valley companies are founded by immigrant CEOs. Some of the most iconic American brands—Microsoft, Google, McDonald’s, PepsiCo, and U.S. Steel, for example—are today led by foreign-born CEOs. It all starts with foreign student enrollment in US universities. Trump is destroying America's future. Liu Ruopeng — known as China's Elon Musk — studied at Duke University from 2006 to 2009 under David Smith, one of the world's leading experts on metamaterials. A Chinese billionaire who studied at Duke University allegedly stole a professor's ideas behind special invisibility technology — and then developed his own prototype back in China. Social sector will get special attention in the second phase of China-Pakistan Economic Corridor (CPEC), said Acting Ambassador of China Zhao Lijian. The second phase begins with the start of new year, 2019, he said while talking here in FM-98’s program “Hum Qadam”. The initial phase of the CPEC has focused on infrastructure and energy projects in Pakistan which witnessed significant growth. During the next 5 years, small projects will be the focus of attention under the CPEC, which include renovation of schools, innovation in hospital system, poverty reduction, model villages and supply of clean water for the public. In addition to this, small scale power generation projects will be built in remote areas, Zhao liJian said adding in the education sector more than 22,000 Pakistani students are studying in China, while more Pakistani students will be sent their for higher education. He said that more Pakistanis would be trained in China and Pakistan to overcome the problem of manpower for Chinese companies working on various projects in Pakistan. The Acting Ambassador said, the construction of Karakoram Highway from Hawelian to Thakot and Motorway M-5 from Multan to Sukkur will be completed soon. Furthermore, he said that 7 key projects of energy have been completed in Pakistan including solar, wind and coal-generated projects, due to which significant reduction in energy problems has been seen, while work on more projects is going on speedily. Referring to the negative reports about CPEC in local and western media, the Ambassador said, CPEC is being built with national consensus. He said that despite controversy in political matters between the political parties, complete consensus about CPEC and Pak-China relations is there inarguably. He contended, public awareness is needed in response to negative reports published in this regard. Zhao LiJian further said that the people should be aware of the basic objectives of negative propagators, because their negative reports generally give the impression that the CPEC is a burden on Pakistan's economy on account of interest rates. All such reports are baseless without having any ground reality, he categorically stated. “Over 22,000 Pakistani students, making them the third largest group of overseas students in China, are currently studying in different fields, including studies of China’s history and culture, medicine, information technology, environmental science, Chinese language teaching and international economic and trade,” according to official sources here on Thursday.